The Crop to Selection command allows you to crop the image. Use the Selection tools to select the parts of the image you want to crop. Sets the fill color. The fill color specifies the pixel values outside the image or selection boundaries. This option allows you to make the pixels transparent. 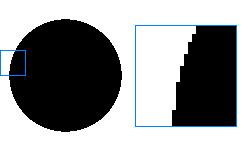 This option allows you to draw smooth flowing lines by shading the pixels along the borders of graphical elements.